Use code TDX-PTRT to get this price. Featuring integrated Freeview HD, the HD Ready Technika 32-2000 allows you to view all of your favourite TV channels and radio stations in brilliant quality. The 32" LCD TV has a 720p resolution with a 50Hz picture frequency for smooth and clear pictures with a brilliant contrast ratio to boost viewing experience. Featuring NICAM stereo sound, a 7-day electronic programme guide and a PC input, the 32-2000 LCD TV also has 3 HDMI connections, 2 SCART sockets and 2 USB ports, enabling you to connect up your HD devices as well as view movies, pictures and music straight onto your TV. can this really play movie files from usb ? 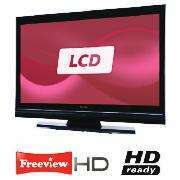 Good price with FreeviewHD. Would probably rather pay a bit more and get an LG or Toshiba which can be had for not much more but you would have to forfeit the FreeviewHD. Voted hot though, £180 is about the cheapest I've seen for a 32"
anyone got one? or review? Got one today for my Mum for bedroom. The usb only plays back music and pics, remote is a bit strange. Good for bedroom not as a main tv. Use code TDX-KPRT to get it down to £179. 21cm deep is that right, seems big ? 21cm would be the depth of the stand.